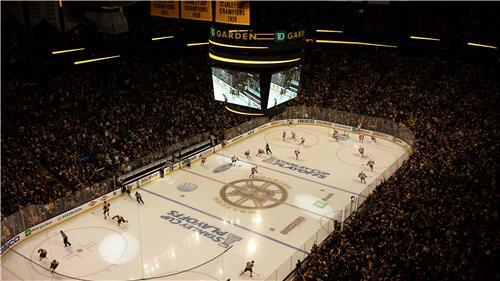 Get updates and commentary from the Boston.com crew as the Bruins try to even their series against the Detroit Red Wings in Game 2 of the first round of the Stanley Cup playoffs. I want @MeredithGoldste to know that I had matzoh brei this morning. Still not as good as playoff hockey. Andy Brickley is your Bruins flag captain for the night folks. Brick is the flag captain before game 2! He's the greatest teammate I've ever had. Proud for him. Andy Brickley is the honorary banner captain today. Official: Paille, Kelly, Bartkowski, Potter out. Kevan Miller in. NESN's Andy Brickley the banner captain. Comcast files complaint, insists on Amonte for Game 5. 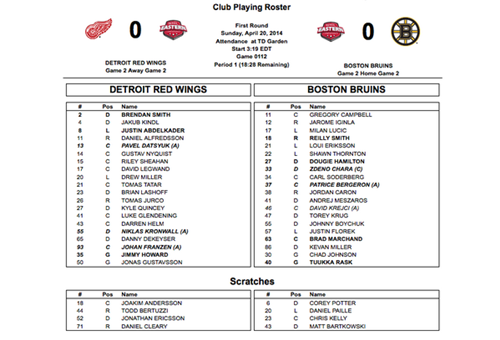 #Bruins scratches: Matt Bartkowski, Corey Potter, Chris Kelly, Daniel Paille. #RedWings scratches: Joakim Andersson, Todd Bertuzzi, Jonathan Ericsson, Daniel Cleary. The carrot is the Cup. 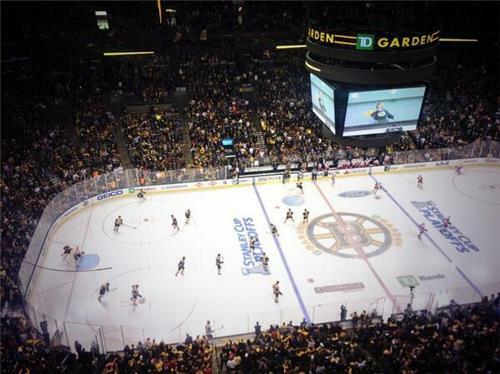 The TD Garden crowd looks fired up. We're almost ready to go. 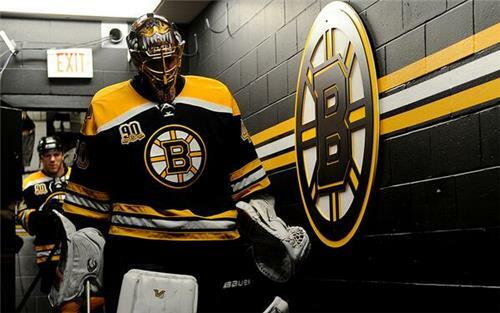 #Bruins starters: Marchand, Bergeron, Smith, Chara, Hamilton, Rask. Only two fist pumps from Rene Rancourt. It's still early, people. And we have puck drop. Chara drilling it into the corner on first shift is what the Bruins do NOT want to do today: easy retrieval, easy out for DET. Kevan Miller makes his playoff debut with, well, a bang. Big hit on Drew Miller. First penalty goes to the #Bruins: Thornton will go off for a hold 1:32 into the first period. Interesting threshold for holding as Thornton goes. Compare with Jurco not getting called on Krejci in Game 1. Bruins holding up well on the PK so far, given they're without Paille, Kelly. Tatar goes for hooking. Makeup call? Uhh, yeah. 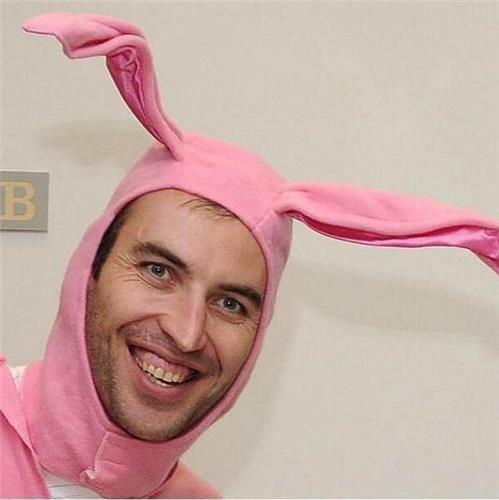 Chara gets tripped up on the way to the net by Tatar, and the #Bruins will have their first PP in 11 seconds. Iginla had a good look on the power play there for the Bruins Just couldn't corral the puck. Detroit penalty over, back to 5-on-5. Kevan Miller with a nice hid there to fire up the crowd some more. Very good zone time for Bruins. But still zero shots on goal. 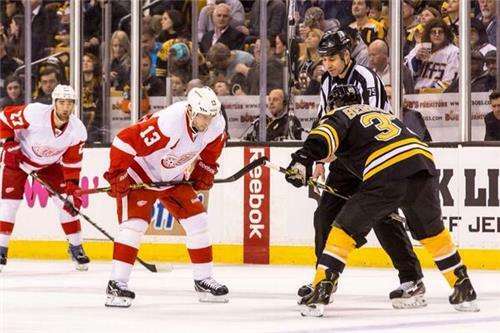 If you had Justin Florek as the first Bruin to score in the playoffs this year, you win. What a play by Justin Florek: Howard tries to clear the puck, Florek takes it out of the air and throws it into the open net. 1-0 #Bruins.